Without a dessert a party buffet just isn’t complete. If you are in a hurry panna cotta is always a good choice as it is ready in just 15 minutes. The most convenient pot to prepare it is a saucepan as its long handle gives you a good grip while you’re stirring. The integrated measuring scale helps you dose liquids like the milk for your dessert – no measuring cup required. This 4 qt. Profi high sauce pan is the perfect addition to my kitchen. The design and structure of this pan is attractive and I love the matte finish. 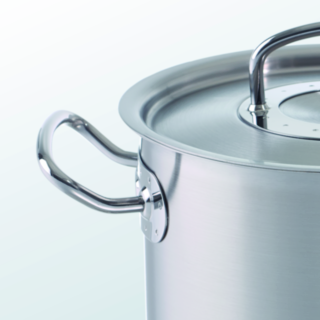 The long handle lets you use two hands to lift and carry a full pan. The pan and lid handle both stayed cool. 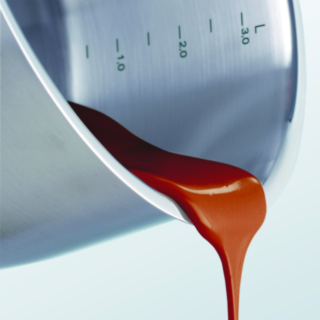 The flared rim allows for mess-free pouring which is a great feature when dealing with a hot pan and liquids. The lid fits tight and retains the moisture. There is a curved transition from the bottom to the walls which makes stirring and scooping contents more efficient. The rivet free interior makes it simple to clean the smooth interior wall. 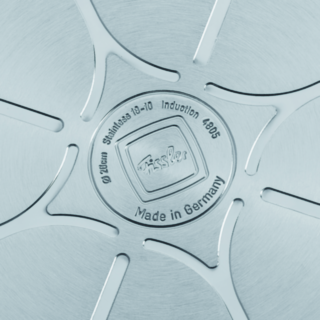 It is dishwasher safe, but these pans wash up easily. very nice pan. heats evenly and quickly. disk covers the bottom pretty well unlike some of the other brands. I do like the fact the lid does condense the steam and circulates it back on the food. It's heavy and fits well. only 1 minor issue. it came with a very visible scratch on the inside so I docked it a star. It was sold from a vendor so I was not going to go thru the hassle of contacting them for a replacement. eventually it would get scratched. I've used it several times before making this review to make sure there were no surprises that I needed to report. One recommendation- lid is heavy but they should be able to design it to be more nesting friendly with the other size pans. The best pot I own. Built to last, and has very even heat. If they were not so pricy, I would have the whole set. Fast shipping and an excellent product. Thanks! This sauce pan is exceptional!